If every poet could get a top songwriter to give their work a musical make-over we would all be on much more intimate terms with our poets. Mike Scott and The Waterboys tackled the poetry of WB Yeats on the album An Appointment with Mr. Yeats; Cerys Matthews did justice to the memory of her favourite poet in Dylan Thomas: A Child’s Christmas, Poems and Tiger Eggs; and the album No Promises by Carla Bruni includes three poems by American poet Emily Dickinson. Top marks, therefore, to Enniscorthy poet Patrick Kehoe for linking up with singer-songwriter and multi-instrumentalist Sonny Condell in this very fruitful collaboration. Kehoe is the author of two collections of poetry, It’s Words You Want (Salmon Poetry, 2011) and The Cask Of Moonlight (Dedalus Press, 2014). John Banville has praised his ability “for conjuring up the South in all its sun-drenched, lush eroticism”! Sonny Condell is one half of the ground-breaking folk duo Tír na nÓg which he set up with Leo O’Kelly in 1969. He is also a founding member of the band Scullion. Sonny also has a busy solo career. It is not hyperbole to describe him as one of Ireland’s most talented, inventive and enduring songwriters. The dust of nostalgia sits heavy on the finely wrought stories of Seize The Day. One can almost hear the shutter click of the camera as the beautiful and vivid here-and-now is confined to the archives of the mind, a sepia-toned snapshot of something gone forever. The simple unadorned production lets the words shine through in a way that stays true to the original. Apart from contributions by guitarist Robbie Overson on two of the thirteen songs, Sonny handles all duties, instrumental and vocal. His even-handed and restrained treatment of the narrative allows each piece space to breathe and, in the process, heightens the overall emotional impact. The radio-friendly Empty Well has a breezy JJ Cale vibe to it with Overson’s blues guitar adding real substance. Again it comes steeped in what was, and is, no more, the memory “Of friends long gone”. Condell has the same easy way with a song as the late Leonard Cohen. This can be heard on Interregnum, a quiet song of love and how, like the seasons, it develops: “By April they were brimming / In a dream of each other”. Gold City is classic Condell. He takes a short five-line poem about big plans always just out of reach, and turns it into a slacker anthem. The plaintive and elegiac Father is filled with love and regret as the boy becomes a man yet will never grow to be the man his father was. Seize The Day is a thing of faded grandeur and quiet beauty. 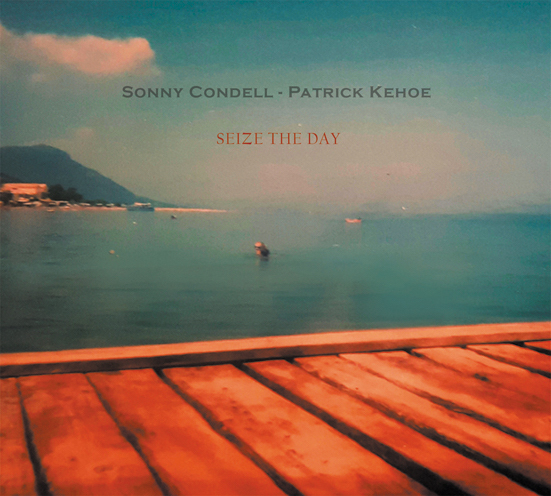 This entry was posted in Album Review and tagged Patrick Kehoe Poet, Seize The Day, Sonny Condell. Bookmark the permalink. Is interesting to hear how it (seize the day cd) effects you, and I find it affirming and very encouraging. the silence elsewhere of any reaction is a cold weather. In the bin out again, and then sending Patrick the mp3.